It is a truth universally acknowledged, that a woman in possession of a tomato fortune must want to stuff some. She might also like to slice a couple thickly for beside her mozzarella, chop some roughly for her salad, skin a kilo carefully for her sauce and crush others enthusiastically for her pappa al pomodoro. It was a rash and wholly impractical decision to buy an entire tray of tomatoes from the market, especially given that I was already hot, bothered and well-laden with two kilos of potatoes, a melon the size of a rugby ball and sweaty baby who was doing his best to wiggle out of the sling. It was a deeply unpleasant walk home, the sun beating down, the potato bag cutting into the crook of my arm, the wooden tray issuing forth splinters, my pitiful triceps quivering like softly set jelly and Luca squirming and crying. I considered abandoning some of my load at the corner of Via Marmorata! But then he stopped crying and giggled, so I decided to keep him. The courtyard of my building has never seemed so long or sun soaked. I cursed all 32 steps and flung open the door before dropping everything, including myself, on the cool tiled floor of the living room. I sat on the floor for some time while my son – resisting sleep – gleefully bashed tomatoes, first against his mouth and then against the floor. The tomatoes were firm, but not that firm! So we crawled from the living room floor to the kitchen floor and ate the casualty squashed on toast rubbed with garlic, doused with olive oil and sprinkled with salt. Well I ate – and noted that I could live contentedly for days on just bread, tomatoes, oil and salt (and the odd anchovy) – while Luca smeared enthusiastically and squealed before sleep got the better of him and he conked-out on my lap. But enough of this rambling! Lets talk about stuffed tomatoes. I’ve had the misfortune to encounter some pretty dreary stuffed tomatoes in my time. I’ve also – thanks to a respectable number of holidays in Greece and now seven years in Italy – eaten some good ones. 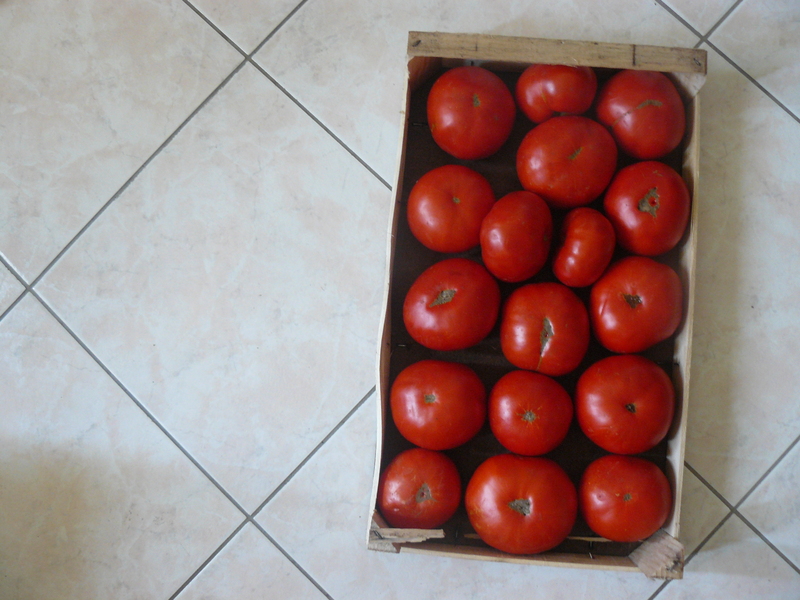 Some very good ones in fact, particularly here in Rome where they are called pomodori al riso (tomatoes with rice.) 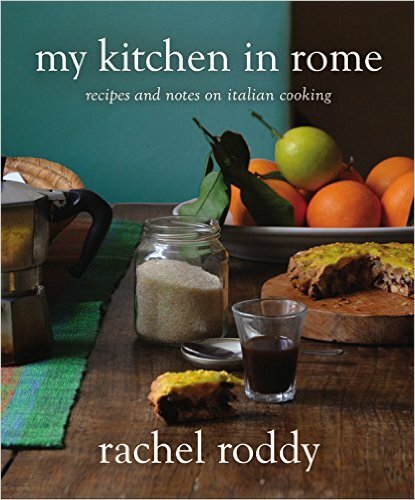 Romans adore their pomodori al riso. They make them at home of course, but are just as likely to buy them from a canteen-like tavola calda or the local forno (bakery) where vast trays of stuffed tomatoes surrounded by a sea of diced potatoes are baked in the bread ovens until their red flesh is tantalizingly wrinkled and intensely flavoured, the rice moist, plump and tender and the potatoes golden-on-top but soft and sticky underneath, the delicious consequence of wallowing in the oily, tomatoey juices that collect in the tray. 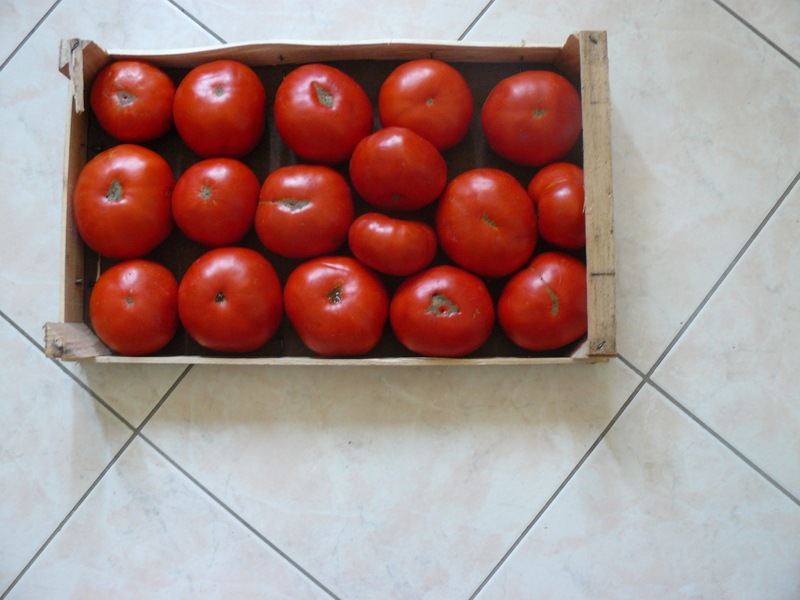 Pomodori al Riso, like much of Rome’s traditional cooking, are without frills, simple, judicious and delicious. Excellent tomatoes are hollowed out and then this jumble of pulp, flesh and seeds mixed with rice, garlic, basil, olive oil and salt to make a stuffing. After a good rest, the stuffing is spooned back into the tomato shells which are then nestled amongst some diced potatoes on a shallow tray before being baked. Then – and this is vital – the baked tomatoes are left to rest for an hour or two in which time the flavors settle, the rice swells and the oily juices from the pan soak back into the tomatoes and potatoes. Good stuffed tomatoes do indeed come to those who wait. Romans know not just to wait, they also know that the key to good stuffed tomatoes is the right tomatoes. Of course stuffing is important too! As is the kind of olive oil, the type of rice (arborio,) the basil, the garlic, the potatoes and the baking. But the key is tomatoes that burst with sun and flavor, whose sweet fruitiness is balanced by just enough acidity, whose deep curves are as firm and fleshy as Monica Bellucci’s, tomatoes that smell of the tangled vine they grew on. They must be the right size too, about the size of a squashed tennis ball. 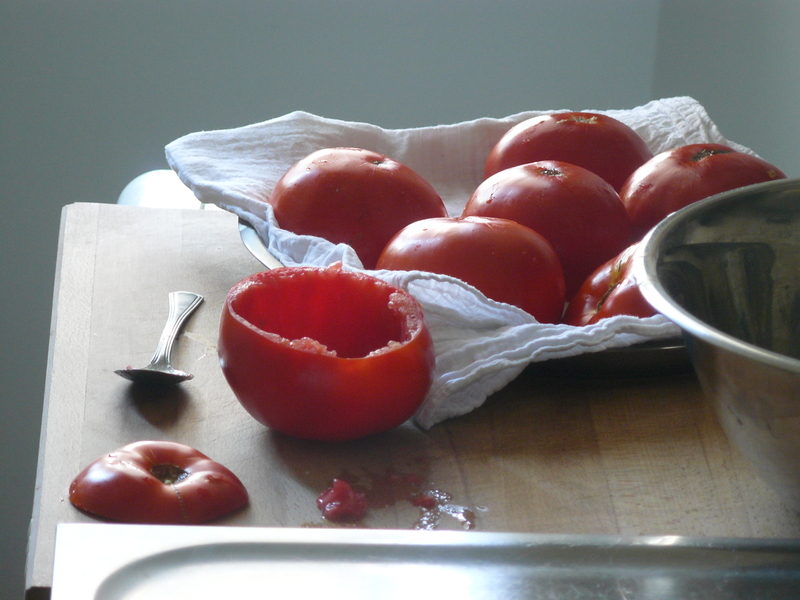 Having chosen your tomatoes, you need to slice a lid from the stalk end of each one. Then, in order to create your vessel, you must scoop out the pulp, seeds and flesh from each fruit. A teaspoon is the best tool for this job, be careful not to pierce the outer flesh and skin. Now remember, wateriness is the enemy, so sprinkle a little salt in the cavity of each tomato and set them cut side down on clean tea towel to drain while you set about making your stuffing. Examine your bowl of pulp, seeds and flesh! Are there any particularly tough, white bits of core? If so, remove them and then blast the jumble of tomato innards with an immersion blender or snip energetically with a pair of scissors (I love to snip energetically) until you have an even pulp. Then add the rice (a generous tablespoon for each tomato plus two for luck), some finely chopped garlic, tons of torn basil, an unruly quantity of good olive oil , black pepper and a fearless quantity of salt to the pulp. Stir, taste, add more salt (it should be courageously seasoned) and leave the mixture to rest – and again this is vital – for at least 45 minutes. At this point, I too like a 45 minute rest, preferably with a cup of iced lemon tea, three biscuits and an episode of desert Island discs. Once both you and your stuffing are well rested, spoon the stuffing into the tomato shells you have sat in a lightly greased oven dish or lipped oven tray. The tomato shells should only be 3/4 full giving the rice space to expand and swell as it cooks. Put the lids on the tomatoes (I went cross-eyed trying to the reunite the eight lids with the eight tomatoes. There were some swingers.) and scatter some diced potatoes around your red globes. Another slosh of olive oil wouldn’t go amiss. Now maneuver the dish into the oven – which you have conscientiously remembered to pre-heat to 180° – for about 45 minutes – an hour. Remove from the oven and then wait. And wait. I waited 2 hours before eating one of my tomatoes. 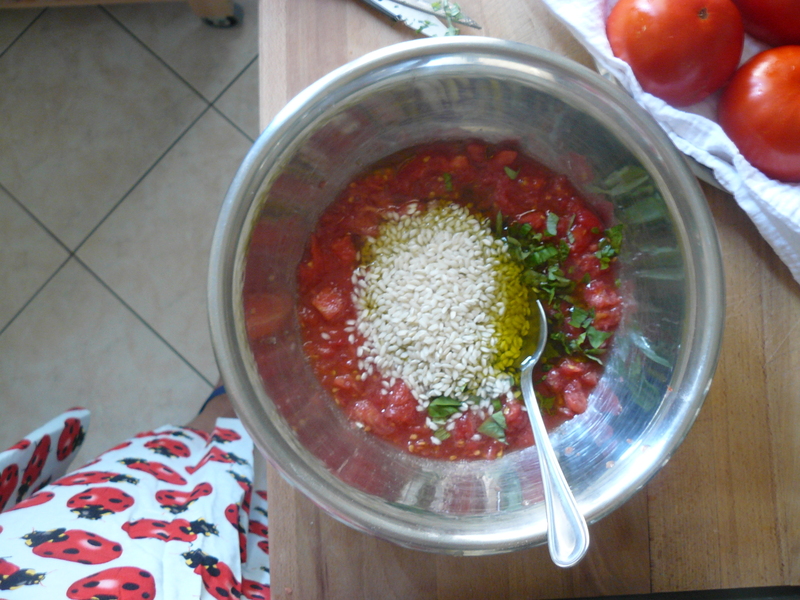 It’s hot in Rome and even hotter in my kitchen so my Pomodori al riso were still quite warm. They had collapsed further, slumped really, like me on the living room floor, making them seem even more wrinkled. Good wrinkles though. The rice was as plump as Luca’s bottom. I was glad I’d been so heavy handed with the seasoning. A pool of sticky, oily, tomatoey juice had collected in the bottom of the dish and I made sure to turn the potatoes in it. I also had spoonful of ricotta di pecora beside my tomato which was entirely unnecessary (the ricotta that is) but very nice. (As usual) I have been procrastinating and faffing over this post for weeks! Thank goodness for Jo’s post which, like so many of her posts, inspired me and guided me. Cut the tops off the tomatoes and set them aside. One by one, hold the tomatoes over a bowl and using a teaspoon, scoop out their insides – flesh, seeds, and juice – and let it all fall into the bowl. Sprinkle a little salt in the cavity of each tomato and then place them cut side down on clean tea towel so any excess water can drain away. Pass the tomato flesh, seeds and juice through a food mill or blast it briefly with an immersion blender. Peel and very finely chop the garlic and add it to the tomato. Rip the basil leaves into small pieces and add them to the tomato. Add the rice and olive oil to the tomato. Season the mixture very generously with salt and freshly ground black pepper. Stir and then leave the mixture to sit for at least 45 minutes. Peel and chop the potatoes into 1″ dice. Put the potatoes in a bowl, pour over a little olive oil and sprinkle over a little salt and then using your hands toss the potatoes so they are well coated with oil. Sit your empty tomatoes in a lightly greased oven proof dish. Spoon the rice mixture into the shells so they are 3/4 full. and then put the lids back on the tomatoes. Scatter the diced potato around the tomatoes. Slide the tray into the oven and bake for about 45 minutes or until the tomatoes are soft and just starting to shrivel and the rice is plump and tender and the potatoes are soft and golden. 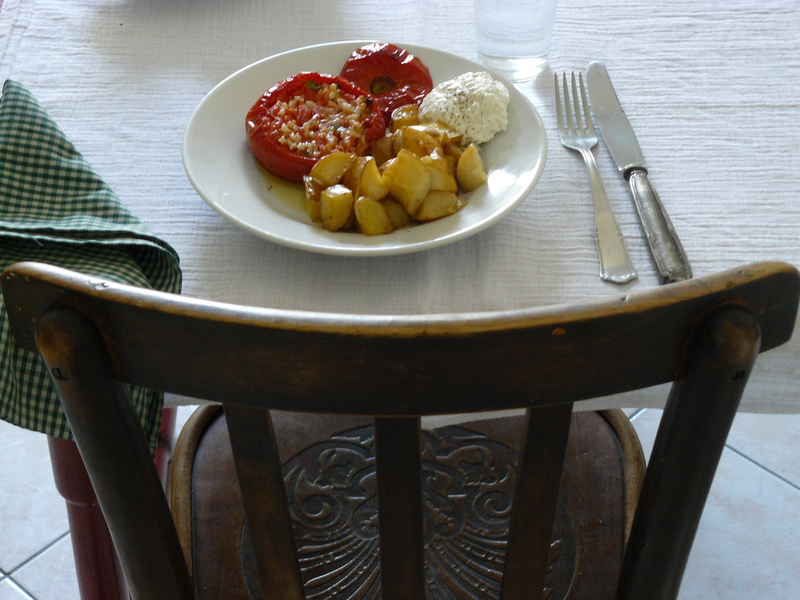 Allow the tomatoes to sit for at least an hour before eating. I love stuffed tomatoes! They looks very yhummy!!! Your pomodori col riso look amazing! Funnily enough I had made some day before yesterday, to serve for Sunday lunch for friends who were going to saunter in at we-did-not-know what time … brilliant! Ps – I really enjoying perusing your blog. All I can say is thank goodness you decided not to drop off your load of tomatoes (or your child) before you made it home. Looks like a beautiful dish, and I loved how you described it. I think your writing about how to make it (the pre-recipe writing) is the best kind of “recipe” there is. I can’t wait to try this, as soon as I’m lucky enough to run into this quality of tomatoes. I was quite relieved to get everything home too, especially Luca who was the wriggliest baby in Europe that day. Glad you like the pre-recipe, I often wonder if it is all rather too long and tedious so it’s nice to get a nod of approval. This is the ultimate comfort food! Thanks for making the effort to haul it all through the scorching heat (and thanks for the clever P&P reference in the opener). Re-visiting P&P is one of summer goals so it has been on my mind – glad you noticed. Comfort food indeed, especially when they have had a good rest and are slightly slumped and properly plump. I get so excited every time I see a new post here. I love your voice and love picturing you, you paint the scene so well!, walking up those steps, arms loaded, hot and weary. I’ve always wanted to try stuffed tomatoes, and your version has be sold. Thank you for this recipe–but more than that, for the window into your world. Very weary, rather cross and not feeling like a very good mother! What a nice comment, so glad you like visiting! Hope you are having a good summer. I adore your blog and my mouth is watering reading this post. I’ll pick up some tomatoes at the farmer’s market next weekend to try this recipe. Hope you’re having a wonderful summer! Thanks NIcole and yes, apart from the odd market misjudgment and moment of despair at Roman public transport, I am having pretty good summer. Off to the sea today so think it might get even better. Hope you’re having a good summer? One of the most beautifully written and charming posts I have read in awhile. And the Austen-reference was great. Praise indeed! thank you, and glad you noticed P&P. Oh, this is killing me. I have yet to find a ‘firm, fruity, fleshy and flavorsome’ tomato of any size. My time will come, and I will make these pomodori col riso. Yes, it will happen. I don’t doubt it will, you are one of my most loyal readers and makers. Here’s hoping tomatoes with the 4 F’s come to you soon. PS–I clicked on Desert Island Discs and thoroughly enjoyed listening to Mary Berry. You have just made me even more excited than I already was for the coming tomato harvest. I am now, officially, very, very, VERY excited. And oooof, your story about the combined market and tiny human haul… I know that walk well. Nice work getting everything – and everyone – home. I had to call my sister after that particularly challenging tiny human haul, to get reassurance that’s it’s ok to feel so cross with your precious little one sometimes. I keep think about peaches with an almond crust…. sounds amazing. can’t get good enough tomatoes here in Edinburgh, but i grew up in Greece and you just took me back there for a second or two! 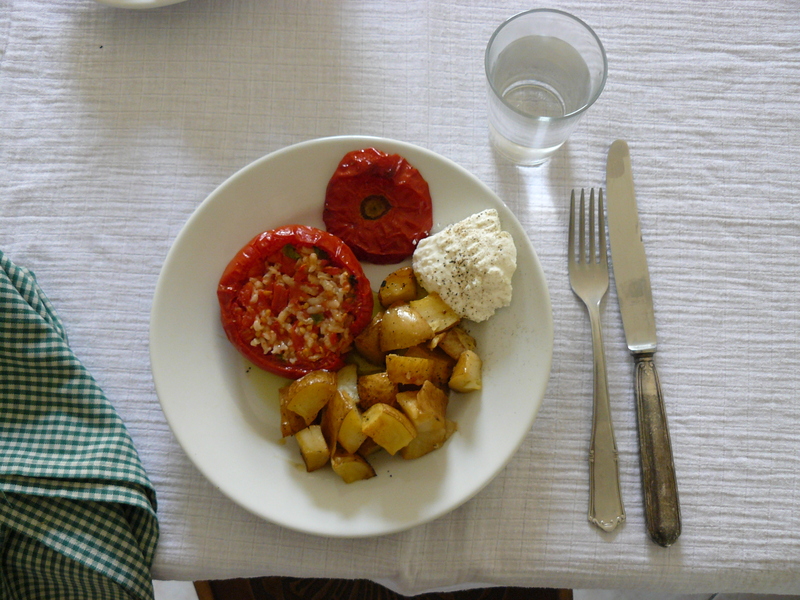 I had stuffed tomatoes in Greece long before I had them in Italy…gorgeous things. You might not have great tomatoes but you have the Festival, lucky you. Fantastic writing as usual – I loved this post from the very beginning to the plump, satisfying ending. Unfortunately good tomatoes in the southern hemisphere are just a day dream right now. The lure of stuffed tomatoes might just tempt me to grow my own this summer! Thank you Mei. It’s strange to think that in Perth it is winter now! Happy winter to you. Yum. This looks delicious. Totally laughed out loud reading your description of the epic walk home from the market. Glad you & your load made it home safe. We are glad too, it was touch and go for a while. They were pretty delicious but that was very little to do with me and a lot to do with the ace toms. Very very wriggly luca. And very noisy luca too! That will be the Roman part. He loved the pomodori col riso though – threw them all over the flat with joy. I have made stuffed tomatoes in similar fashion–but never surrounded by potatoes–what a splendid way to capture all the tomato juices. last night I globbed the last of my homemade ricotta into a rumbling pot of zucchine, ditalini and red sauce, per your suggestion. Quite delicious. Sounds delicious. Yes, the potatoes are good! They do lose their crispness with all the waiting, but the soggy deliciousness makes up for it. By the way (again) I loved your tomato poem. A wriggly, noisy, cheeky, funny beauty. Not sure he overshadows the sardines though? On second thoughts, yes he does, but only just! My granny always said Ta love. I like it, Ta love to you too. And you are right of course, tomato bashing is excellent fun and to be encouraged. I just need to perfect the mantra ‘He is 10 months, he is playing and exploring! Do not worry about the mess! Do not try and wipe! stop fussing! Coming over to see you now. Loved this post — particularly the nod to Jane Austen and the description of your walk home. I wish I could try the recipe, but my tomatoes — which resemble green apples thanks to Seattle’s cool and cloudy summer — fail the firm-flavorful-fruity test. I wish I could send you a couple (that tray was 5 euro’s) but I don’t think that is very practical. You will just have to visit Rome! I’m cooking, or buying. Dear Rachel, I just made a batch of these wonderful thingies and they’re amazing! Thank you so much for the recipe. Must forward to my father, the true tomato maniac in the family. Best to you and Luca! Kaja – The very best comment! So glad you made them and even more glad they were a success. This is a big statement but… I think this might be your best post. Wonderful. To boot, I’ve been lamenting the dearth of recipes tempting enough to attempt with US ingredients, but – hurrah! – I suspect you may have broken the dry spell (big fat tomatoes are actually quite delicious here, and readily available from the farmers’ market). So thankyouthankyou. PS – how big and more gorgeous is that boy of yours getting?? Big fat tomatoes – excellent, go forth and stuff. Now lets talk about the frozen banana on a stick dipped in chocolate! I feel I need to try this, or make this. Oh and thank you. S – you are of course in the know and privy to such Roman secrets. I totally agree, they are superb, probably some of the best. Maybe one day we will eat them together, I hope so. Made these a few weeks ago and honestly wasnt quite sure I would like them but thought my wife would. I put them together one afternoon/evening and then let them in the fridge overnight until the next afternoon. Baked them the next afternoon(after much fretting about whether your degrees were in Farenhiet or Celcius). I halved the recipe though not being sure if they would go over well for the two of us. Tonight I have ten tomatoes sitting stuffed in the fridge!! As you can imagine we LOVED them. I ate my @ room temp, my wife warmed hers up. Both of us really like them! A LOT! Tonight though I used a pan that they fit more snugly in to keep the juices all together for those potatoes. The first time I used a sheet pan and the juices ran to the sides and I dont think the potatoes were as good as they could have been or as good as they are in your home! 🙂 I am loving your blog and really would like to try the green sauce sometime soon too!! I’m dismayed that only one of the respondents above noted the Pride and Prejudice reference. No doubt their attention was swayed by the shameless exposure of rubicund orbs. That may be the serious writer’s biggest obstacle in this ultra-visual blogging world. As you know, Amy and I have long admired your ability to straddle both visual and verbal so beautifully. Long may it continue. Rubicund orbs – Hello Jonny and yes, I was surprised too. I am however not surprised you noticed! Praise indeed! I have good teachers! This is probably a silly question, but is the rice raw or cooked before going into the tomatoes? I saw your recipe in the guardian and cooked it yesterday. I used what I thought were medium tomatoes and ended up with way too much filling, enough to fill a red pepper with. As my tomatoes were smaller there was also not enough pulp to allow the rice to cook through completely, so it was a little firm in places. The taste was great though, and since I have lots of tomatoes in the garden I’ll be making it again. One question, why is there so much olive oil in the filling? And the guardian recipe instructs to cut the potatoes into short chips, but later talks about diced potatoes. Not that it matters, but with the amount of potatoes I needed a fairly large baking dish to fit everything in.